Nancy's Nook : Looking for Heather's Art? For now I have to tell you this: we have a new great niece! Her parents are Marian and John, and she has an older brother, Finn, who is two and a half. We can't wait to meet her! She lives in Austin. (Marian's mother is Sam's sister, Pat.) She was born April 29 and weighed 6 lbs 13 oz. and was (is) 20 inches long. Eloise is a gorgeous baby with a pretty name too. God photo of Pat on the sidebar too! She's BEAUTIFUL!!!!! Congratulations to Marian and John!! What a beautiful baby... 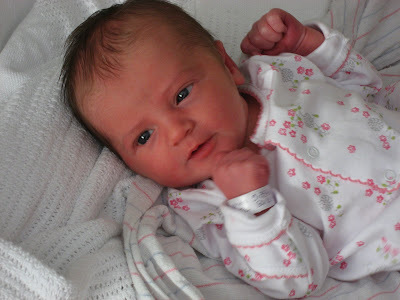 I am pleased that something good happened on April 29. :) What a GORGEOUS girl. What a beautiful baby girl! Congrats to all!